If your job involves peeling shrimp, consider getting a system. The Jonsson Shrimp Peeling System. Shrimp peeling specialists since 1955. 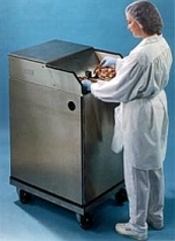 Jonsson systems peel any kind of fresh or previously-frozen headless shrimp. Peel all warm water species, pond-raised or wild, freshwater or ocean shrimp with superior results every time! Shrimp are placed in a plastic tray. The rest is automatic. A small clamp picks up a shrimp from a plastic tray. The shrimp is carried through a centering guide as a large clamp closes with a firm grip on the shell. If tail-on processing is selected, the body shell is broken from the tail segment. The large clamp carries the shrimp through a patented cutter and guide system that precisely splits the shell. A pair of brushes removes the vein. A fork enters the shrimp meat, pulling it gently and cleanly from the shell. The shell is then discharged at a different location. After peeling, visual inspection and minor handwork complete the process. What can you do with shrimp?